Includes four 45 lbs. plates, two 35 lbs. plates, two 25 lbs. plates, two 10 lbs. plates, six 5 lbs. plates and two 2.5 lbs. plates. Designed using state-of-the art technology. Encased in durable, heavy-duty rubber to prevent scuffing and damage to equipment, walls and floors. Impact-resistant. Impervious to rusting, chipping, flaking and losing their color. Integrated metal sleeve provides smooth, secure fit onto any Olympic bar. Made in China. 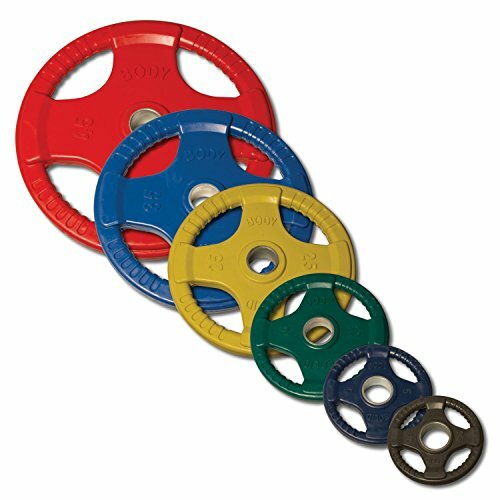 ORCT255 Colored Rubber Grip Olympic Plates Set 255 lbs.